I have not made any shoes in a while but finally I had some time and made a pair of bellows tongue shoes. They are so comfortable! And the best part is that I used fabric for the top so if I change my mind and want a different look or the fabric wears out before the leather, I can just put in new fabric. Also, they will be cooler to wear on hot days. 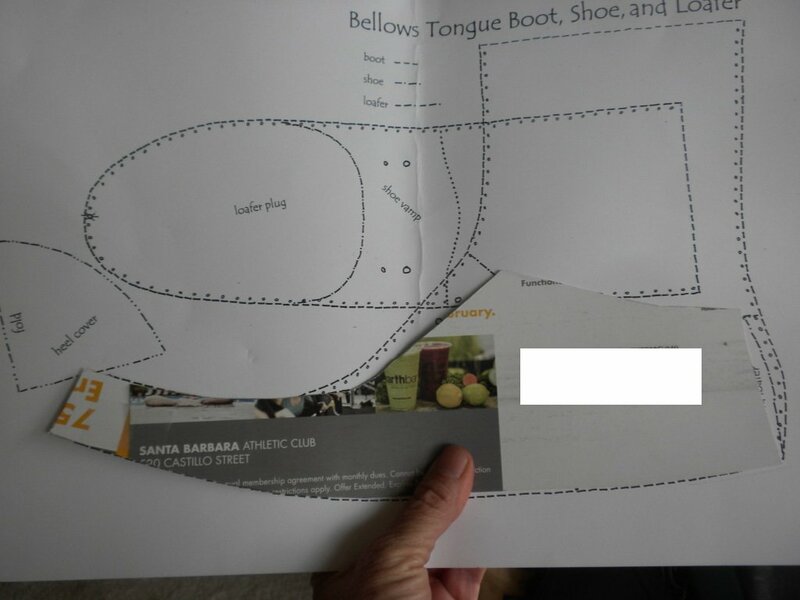 I have sent some pictures for you, including one of how I have had to modify the pattern to fit my feet. I cannot do that rounded heel cup thing at all otherwise I step on the seam and it hurts. I guess my feet are a lot differently shaped than yours! I got the leather from a yard sale, the fabric from an old pair of jeans someone threw out and the soles from a local store that sells industrial cast-offs. We have a couple of shoe designers in town, including the company that makes the Teva, Simple and Ugg brands, so sometimes soles, leather and shoe parts turn up there. note from Sharon: Diane used a pattern from How to Make Simple Shoes for Women – with your own two hands! to make these shoes. She put some time into customizing the patterns, but I think she agrees that the results were worth the effort. I love the slope of the topline, the loops she made to catch the laces, the color of the heel support piece and the little touch of braid – so many opportunities for creative thinking! In this article is a reference to toluene, the chemical found in shoe cements. To avoid its use I stitch soles to shoes instead of cementing them on. The number of industrial chemicals in widespread use recognized to cause childhood brain impairments has more than doubled since 2006, scientists said Friday. Researchers at the Mount Sinai Hospital and Harvard School of Public Health cited six broad groups of toxins in 2006 as having a direct impact on human brain development. Now, they have identified another six, which include metals and inorganic compounds, pesticides and dangerous solvents. Based on their examination of chemicals that are widely used — but untested for human safety — the scientists concluded that fetal and early childhood exposures have grown into a silent pandemic of neurodevelopmental disorders, such as autism, attention-deficit hyperactivity disorder, dyslexia and even losses in IQ points. 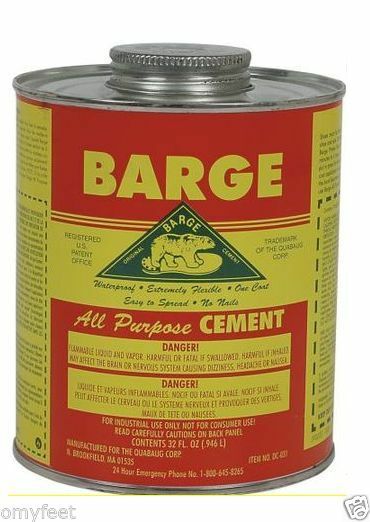 Some of the brain-damaging compounds, they say, waft through the air of countless homes as house dust. “These are chemicals that Americans are exposed to on a regular basis,” said Dr. Philip Landrigan, chairman of preventive medicine at Mount Sinai’s Icahn School of Medicine in Manhattan and director of the Children’s Environmental Health Center at the hospital. In the first study Landrigan and colleagues named arsenic, arsenic-based compounds, lead, methylmercury, TOLUENE and polychlorinated biphenyls — PCBs — as key brain-damaging culprits. That list was culled from a longer one containing 202 brain-damaging chemical suspects. I thought readers might enjoy this email and the photo that accompanied it, which describes a mother’s shoemaking journey, thus far. My son has narrow heels and needs a wide toe box. Thus for him I have had to change the patterns completely. 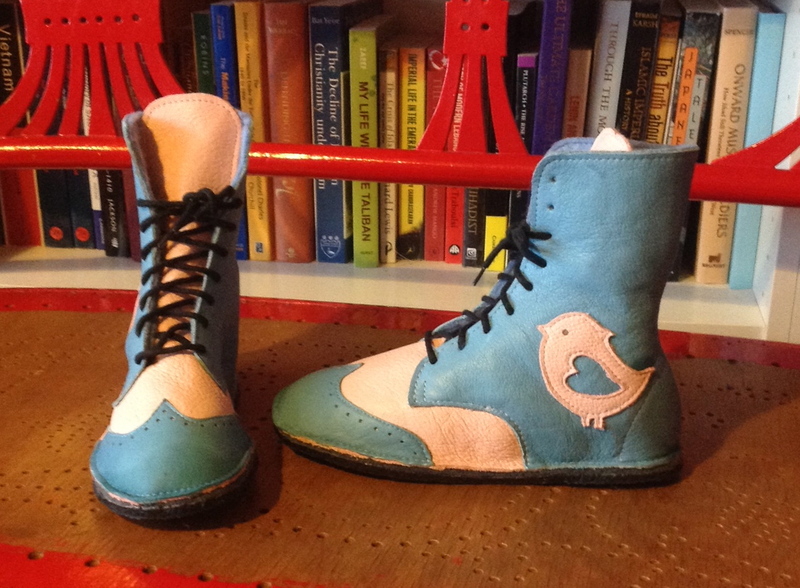 Here is a photo of my 8-year-old daughter’s boots, made with your women’s derby pattern. The smallest pattern was printed at 94%, which makes about a US size 2, I think. I also made the boots taller, as these are for Scandinavian winter. 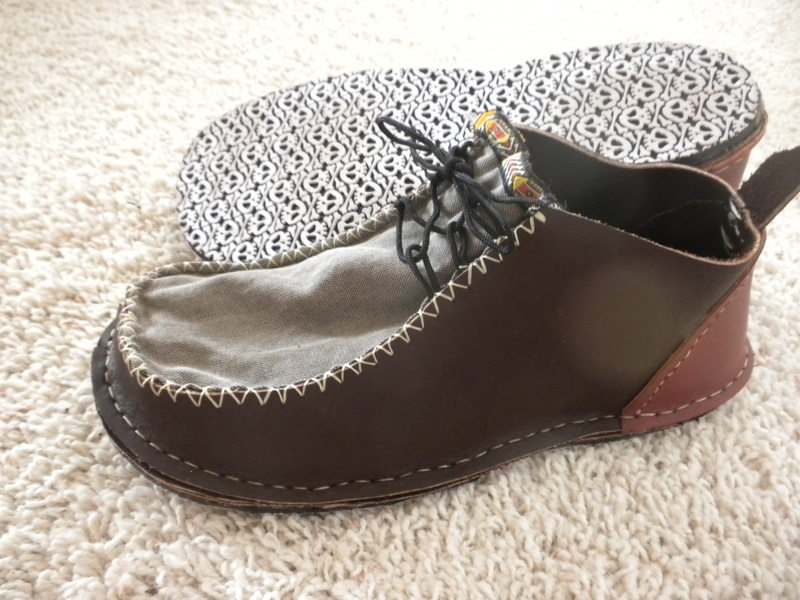 They were made out of organic leather and there is a thick layer of 100% wool felt all over inside, except on the soles. The soles are a layer of some other type of wool felt next to the foot (probably some percentage of polyester, as these sheets are firm and even, unlike the wool inside and don’t pill), and two layers of 1/8 plantation crepe glued to the felt. In other words, these are an attempt to make “barefoot boots” suitable for weather that requires something warm, especially to insulate against the snow. They are very light and flexible. The color combo is not necessarily what I would choose, but was requested by my daughter. They actually look much nicer in real life, after having been stretched over lasts. I have made all my shoes completely without lasts, as I was not able to get some until a couple of weeks ago and this is how I had taught myself before buying patterns. While I use a machine and thus don’t make any holes for stitching, I have had little trouble lining up the uppers and the sole, even without lasts. The lasts do make the front look a lot nicer, though, more like a shoe, less like a slipper. I have used an old hand crank Singer, which does a nice job… mostly. However, attaching the upper to the sole (one layer of the same leather) has usually ended up in swearing and a sore finger, as I need to press the presser foot with my thumb in order to make the machine not skip stitches, especially at the front and back where there are three layers of leather. It is just not meant for this kind of work, even with a leather needle and all. To hopefully solve the issue, I just bought a Frobana oustole stitcher. While it is way too much machine for shoes with such thin soles, I am hoping it will be a good solution. As it stitches sideways, it removes the issue of one side of the presser foot needing to press on too much leather at the heal and all that. Also, if I manage to buy the part that the edge of the sole is pressed on while sewing, it will always sew at the same distance from the edge. We’ll see if I can actually make it work. At the moment I have no more soling, so I need to figure that out first. From what I understand, Shreiner wants a minimum order of 200 dollars of each item. (Is this correct?). As I used the 1/8 in. black sheets, I would need to find someone else who used the exact same one in order to not have to buy so much. (Just in case you, like me, have a general idea of what “ubiquitous” means, but want to understand it better, it’s “seeming to be everywhere at the same time”). I was reading an article in National Geographic last night, “To Walk the World”. That’s basically the author’s plan, to trace the path that homo sapiens took to populate the world. He started off in Ethiopia, and the above photo and paragraphs below are taken from this article. “In the affluent “global north”, where fashion caters to every whim and vanity, shoes announce their wearer’s class, hipness, career choice, sexual availability, even politics (the clog versus the cowboy boot). 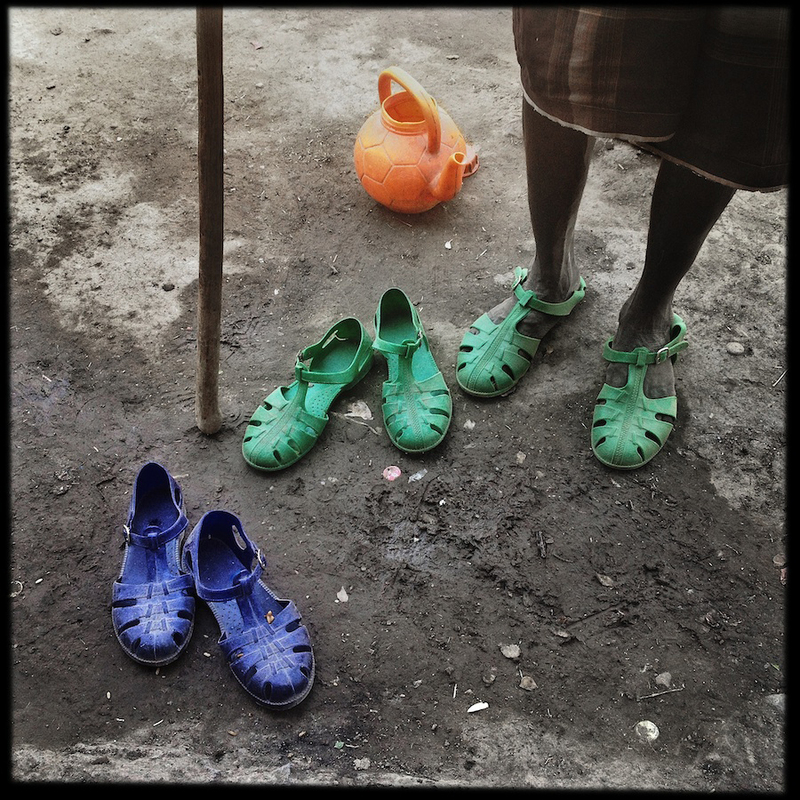 It is disorienting, then, to be walking through a landscape where human beings – millions upon millions of women, men and children – slip on identical-style footwear every morning: the cheap, democratic, versatile plastic sandal of Ethiopia. Poverty drives demand. The only brand is necessity. Actually, I love the style of these sandals, commit myself to making myself a pair in that blue leather by the summer! And I appreciate the author’s description of what a wearer’s shoes signify – I’d say “hipness” leads the way. But what could be more “hip” than shoes you have made yourself? I have let go of blogging commitments in a frenzy of new product and new website creation. 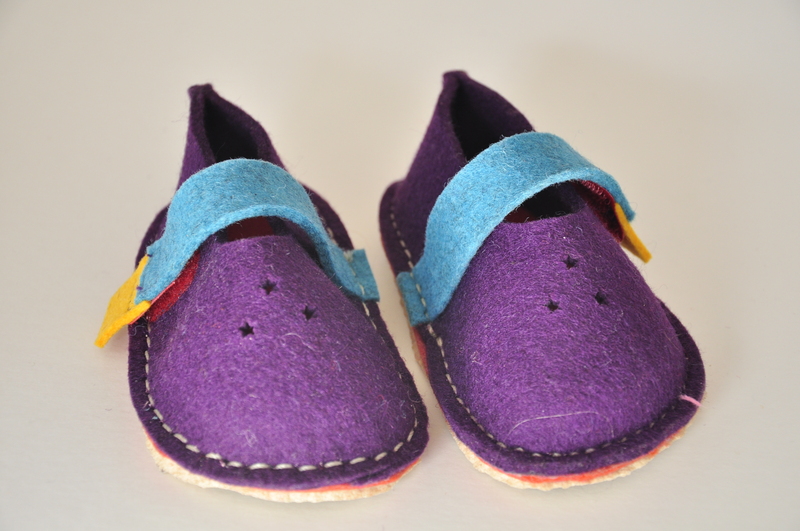 In the spring a marketer suggested that I have children’s shoemaking kits to sell, so a busy mother (or someone else who loves the little person) could more easily make the first pair of shoes for her child – and hopefully go on to make many more! Well, those kits have occupied me “big time”! Now that I have a one-year-old (enchanting) granddaughter and have miraculously found some small children’s lasts on etsy (they were sold as “lovely decorations for a children’s room, but I had more practical uses for them!) I have a much better sense of what styles and shapes of shoes would actually work well for children’s feet. They have to be easy to get on! Then they have to stay on! They have to be healthy – flat flexible soles, wide toe box – and be made of healthy and earth-friendly materials. And easy to make, with opportunity for the maker’s creative input. And they have to be adorable! Somewhere along the way I became enamored with using 3mm (quite thick) felt for the shoes in the shoemaking kits. Children commonly wear felt shoes in European countries, and I believe they would be popular here. I’m using the most basic pattern for the kit – it’s the same one my Italian grandmother used to make my baby shoes from black velvet, with a little ankle strap that closed with a tiny pearl button. And, this led me to realize that I could make similar kits to get “grown-ups” started in making their own shoes as well. I’ll tell you more about that project in my next blog…but if you’d like to have a pair of shoes similar to these little ones, please check back! 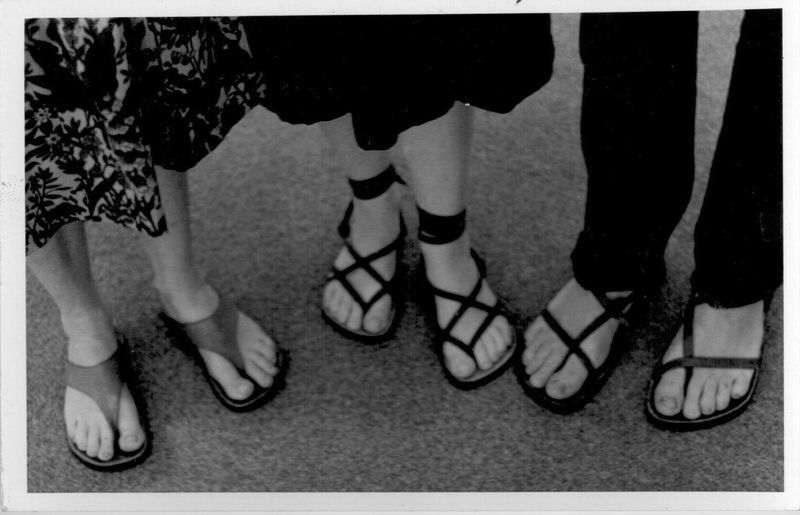 Sandal photo to make your day! I’m never disappointed when I go to www.huaracheblog.com, there’s always something fascinating – today I saw a diagram for making huaraches that was patented in the early 20th century – now you too can make huaraches, just follow the pattern! While there, I wanted to find a photo of men wearing sandals with laces around their ankles, to show my husband; he couldn’t imagine men wearing such things. 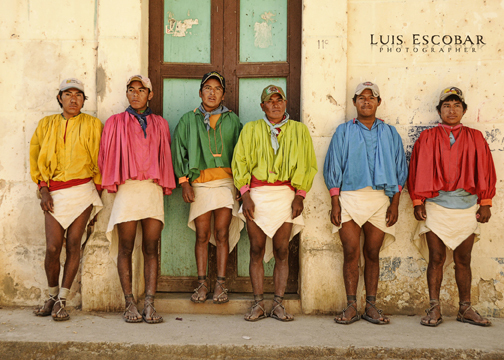 Here’s the beefcake photo I found to educate him on the commonality of such sandals in certain cultures. I’ve posted the pattern here, of course they could have different shapes, but this is the tried-and-true-one. The length for the belt loop is 4 inches. I used the same pattern for the bracelet loops, reducing the length to 2 5/8 inches. To make the slits I used a 1/2-inch hand punch. And, I used a “line 20” snap for a closure. It’s fun to set snaps, all you need is a little metal post and a little round “anvil” with a concave side that completes the setting kit you can order from Tandy Leather along with the snaps. 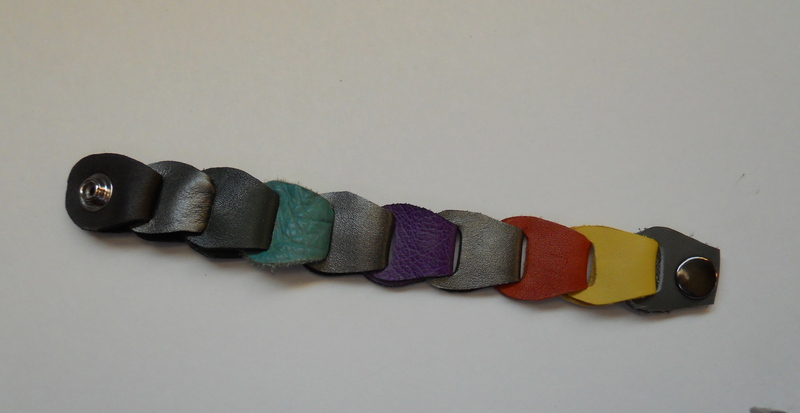 In case you didn’t make belts from these loops back at Na-Wa-Kwa Girl Scout Camp, like I did, (all brown, of course) here’s how you make the chain of loops: fold the first loop (the grey one) so the slits line up. Take the second loop (the yellow one) and pull it through the two grey slits. Fold it in two just as you did the grey one, and you’re ready to insert the red one. Keep on going until it’s the length you want. For the last loop, don’t punch any slits in it. Set the two parts of the snap, and you’ve got your bracelet. I purchased the Trippen Book several years ago, which gives an overview of Trippen (an imaginative and innovative German shoe company) styles and its shoemaking process. If I need some design inspiration, that’s the book I’ll pick up – along with Aki Choklat’s Footwear Design. Trippen’s designers have more ideas on how to tie, fold, cut, and manipulate leather to make shoes than any other team I know of. The sole is sewn to the upper, not glued. This mechanical fastening provides for an almost complete avoidance of solvent-based adhesive in the attachment of the sole and allows worn soles to be removed and replaced. Since I stitch on soles to avoid using these adhesives – although, as a “sole” proprietor, my soles are much simpler (and my shoes can easily be re-soled and the oldsole recycled)- I was delighted to read that their efforts and mine are heading in the same direction – away! – from those adhesives that are toxic to the individual as well as to our shared environment. Allan Block was a friend of mine, I met him when I first was selling shoes at Old Songs Festival in New York State – he had the booth across from me, so I was treated to his fiddle playing throughout the day. There was a woman hanging out with him who was one of the women alluded to in the following article by the phrase “he was married several times”. Barbara Storm became a dear friend of mine. She wove beautiful fabric from which she constructed fabulous little chenille hats. We dreamed of going into business together as “head and toes”. She developed lung cancer and died, and I miss her to this day. Allan was famous because his sandal shop in Greenwich Village was a hang-out for musicians such as Bob Dylan and Joan Baez during the 60s (if I remember correctly the center pair of “dogs” belonged to her).